Barbara has built a mysterious box in the backyard near the coop; what dangerous creature lurks within? The Chicken Squad is on the case (much to retired rescue dog J.J. Tully’s amusement). Dirt (the smart one), Sugar (the know-it-all), Poppy (the boy), and Sweetie (well, she shows up) decide to investigate the strange new box on stilts that Barbara has placed in the backyard. With their spy kits (containing binoculars, mustaches, and marshmallow belts), the chicks are ready for action. After three long minutes of surveillance (that may have included a nap), Dirt, at least, has ruled out a shark as a possibility for the backyard’s new dangerous denizen…Sugar’s not so sure. After careful review of the evidence (and accidental poetry) they decide it must be a rabbit…but the door has been left open! Rabbits can’t survive in the wild! So despite the fact that Sugar’s compass is predicting scorching weather (don’t ask), the Chicken Squad is ready to head into the wild to save the maybe-bunny. 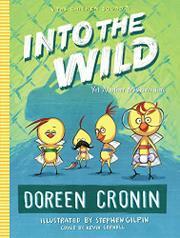 Cronin continues her series of mystery misadventures following the chicken siblings, while Gilpin takes over illustrating duties from Kevin Cornell (and young fans might not notice the change). Many illustrations and frequent word repetition (not to mention the giggle-inducing high jinks) make this series a great choice for those new to chapters. Final art not seen.